Your initial consultation involves taking a history and pulse and tongue observation to form a diagnosis from a TCM perspective. This allows us to then select appropriate acupuncture point and herbal scripts for you individual needs and symptoms. Once the diagnosis is established and explained to you your treatments can begin. Acupuncture involves using very fine sterile needles to regulate the Qi. Qi is the vital energy that flows through the meridians of the body, by regulating or stimulating the Qi of the body with Acupuncture we can profoundly affect a person’s experience. The balancing of a person’s Qi can assist with physical symptoms as well as balancing hormones and chemicals within the body which are the main regulators of how our bodies function. When the Qi is abundant, free flowing and harmonious we feel well, happy and healthy. Acupuncture is very gentle and relaxing and the sensations felt are like a sensation of energy such as tingling or pressure and very comfortable. Herbal Medicine involves classic combinations of Traditional Chinese Herbs to strengthen and stimulate the body’s resources so we have a greater ability to heal and become well. 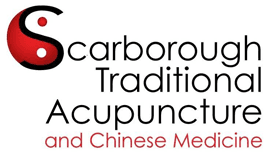 The patent herbal products we use at Scarborough Traditional Acupuncture are produced to Australian TGA standards (Therapeutic Goods Administration). This ensures all products are produced to the highest standard from top quality ingredients. Cupping involves placing small cups on the skin’s surface to create a vacuum effect to assist with circulation and relieve muscle pain and spasm. Moxibustion involves the burning of special herbs to create a warming effect to assist the acupuncture needles in the moving of the Qi. Acupressure or Tuina involves using massage to effect the flow of qi through the meridians and is sometime used as an adjunct to your acupuncture consultation.